Whether it arises from burst pipes and blocked drains, or a natural disaster, water damage can create a huge mess. If not contained immediately, you may end up losing your valuable possessions. Also, water damage carries huge health risks. This article highlights some of the key steps you can follow to save your home while staying safe in the event of water damage. If the water is running from broken or burst pipes, turn off the water from the main valve. This is the first step you should take as long as the water is coming from inside the house. You should make a point of showing every family member where the main valve is because you never know who will be in the house when an emergency strikes. The same applies for electricity and gas. If the damage is severe and the house is flooded, you should turn off the electricity and gas from their mains too. Water damage is covered under home insurance. Therefore, call your insurance company immediately so that they can start processing your claim. However, note that not all water damage will be covered by your home insurance policy. For instance, most insurance companies will not cover flooding that was caused as a result of your negligence. Additionally, if you live in an area that is prone to natural disasters such as floods, you may be required to take out another policy to cover water damage from such disasters. Before any cleanup is done or pipes are fixed, take pictures of the flooded areas and the source if you can identify it. You should also take pictures of any belongings destroyed by the water damage. 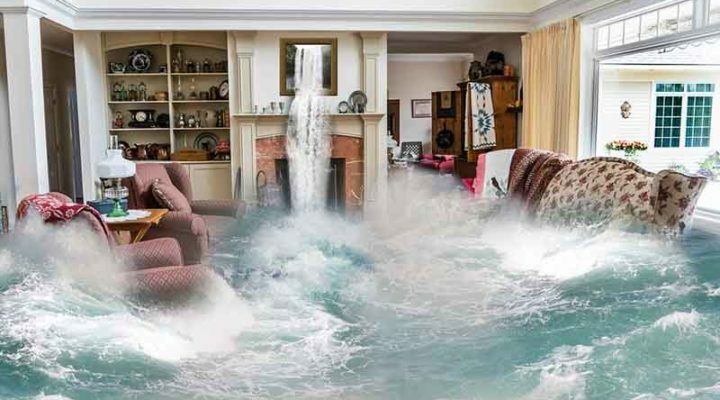 For extensive water damage, you will need to call in an expert to remove the water. Consider companies specializing in water damage restoration Minneapolis. These are specialists who have the skills and advanced equipment to remove the water fast while safeguarding your property and preventing further damage. Additionally, they will clean all your belongings that got wet in the process, and eliminate bacteria and other harmful organisms. A general cleanup also eliminates stuffy smells from the house. Finally, the process ends by replacing parts of the floor, wall or ceiling that were damaged. If the damage is not severe, drain the water and dry out the affected spaces. Start by moving your valuables from the wet spaces so that they don’t get damaged. Draining the water immediately will mitigate the damage. However, note that you should only drain the water by yourself if it is from a clean source. Contaminated water from the sewage and toilets should be left for experts because it carries many risks. Additionally, avoid using any electrical cleaning equipment to dry the water. Use a broom and a mop instead. After removing the water, call in a professional to fix the cause of the problem. Taking action the second you recognize water damage is the best way to mitigate loss. However, don’t do anything that may compromise your safety. If the damage seems beyond your control or understanding, step back and wait for the experts to handle it.